For each donor ID most recent donation date and amount donated corresponding to that date. I have tried several Query and Filter function but does not seem to work. Just be sure to format the resulting date column as dates, since by default is will use the raw number format of the data (i.e., the number of days since December 30, 1899, which will be numbers in the mid-40,000 range). 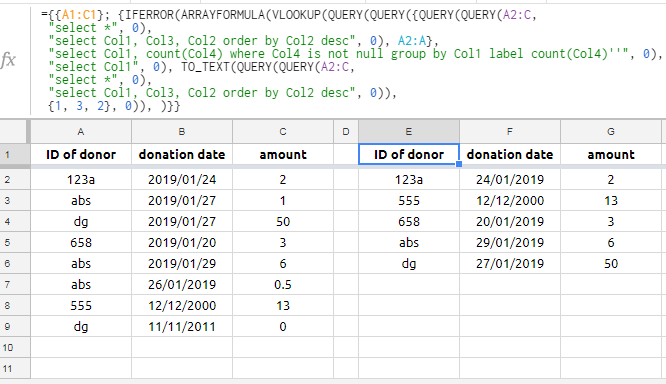 We VLOOKUP only those values in another virtual range: a QUERY of the A:C data upside-down by date (i.e., with the most recent dates always on top). By looking up only unique donors and the header from A in this upside-down range, the first match found will always be their most recent donation. We return columns 1, 2 and 3 from this upside-down QUERY range (i.e., the three points of data, and the headers). FALSE tells Google Sheets that the virtual range is not in order by the key column (Donor) and instructs it therefore to look for exact matches only. The IFERROR wrapping on the VLOOKUP prevents the formula from trying to return a result for that UNIQUE blank I mentioned. Not the answer you're looking for? Browse other questions tagged google-sheets formulas google-sheets-query google-sheets-arrayformula filter or ask your own question.